Summary: This is a large, photo-filled, coffee-table book about the musical Hamilton, which (in case you have no exposure to pop culture whatsoever [in which case, how'd you find my obscure little blog???]) is a hip hop musical about Alexander Hamilton. Thoughts: While I do actually own a physical copy of this book (which is awesome, by the way), I chose to listen to this as an audiobook. The book itself consists mainly of the full libretto of the musical (with annotations from LMM himself about the various lyrics and musical lines, etc. ), with short "behind the scenes" chapters interspersed throughout, lining up chronologically with the songs at times, and discussing the history of the musical itself from all different angles: the writing, the development, the choreography, everything. Again, I have the book itself, but since my daughter has decided to take it for herself like a dragon hoarding its treasure, this listen was the first I'd actually "read" it. If you're a fan of the musical, and if you're a fan of music/theater/writing/everything creative that went into the process of building this already-legendary show, then you will totally love this book, in whatever form. I loved hearing about individual songs. I loved hearing about the cast members. I loved hearing about everyone else who had a major part in creating this show in addition to Lin. 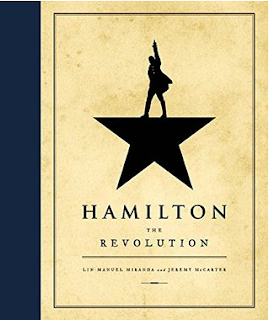 I know this is the sort of book that any Hamilton fan would want to have anyway, but if you haven't actually had a chance to READ through it, I definitely recommend sitting down with it.